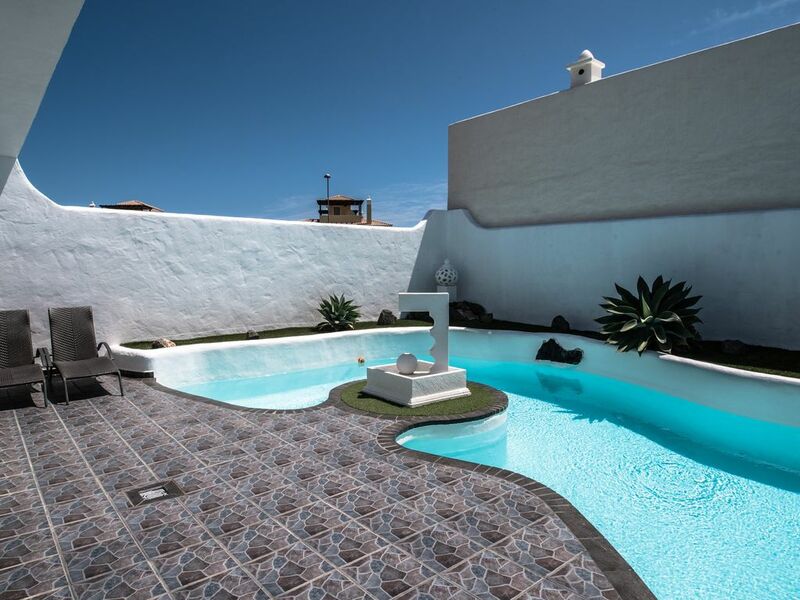 Villa in Bahia Azul, Geafont, Corralejo, Fuerteventura, Canary Islands - Private, sunny, modern. Fully fitted kitchen. Well maintained on secure developement. Casa WooWoo is our beautiful home made ready for your rental holiday. All your accomodation needs have been considered so you can feel at home with the added extra of the sun! The lovely lagoon style pool is great to dip in and have a swim to cool off from the sun during the day, or by night. Heated all the year round. Or enjoy the hydro spa (also heated all the time) located on the roof terrace with a glass of champagne in your hand, overlooking the dunes in the distance or looking at the clear night sky!. A great romantic getaway villa. Mosquito blinds for comfort. Cot and high chair provided for young family bookings. Prices vary and offers available. Well looked after modern villa with own private pool and hot tub. 3 bedrooms 1 bedroom with adjoining door for families. Pool and air conditioning included in price.Light and airy. Own private roof terrace with tiles and artificial grass. Pool area tiled for more grip. Beautiful 6 person hydrotherapy spa. Owm private heated pool. En-suite bathroom to bedroom , with shower, wc, sink and bidet. En-suite bathrooms to bedrooms 2 and 3 with shower, basin and wc. Toilet with basin and wc off lounge for guests. Beautiful contemporary living room with two, 3 seater sofas, SMART TV digi box. Mosquito Blinds fitted to outer doors. Fully equipped kitchen for 6 guests contains large fridge/freezer, cooker, hob/extractor, microwave, dishwasher. Plenty of utensils etc. Washing machine upstairs on the roof terrace with clothes horse and pegs. High Chair available . Roof dining area for 6 people. Selection of books in TV unit. Roof Terrace with Dining area, BBQ, Jacuzzi, sun lounging area. Sea view. Artificial grass to prevent slips and trips and cool under foot. There is a 18 hole championship golf course in Caleta De Fuste 35 mins from the villa. There is now a Par 3 9 hole golf course in the development next door to Bahiazul. Heated Salt Water crystal clear private pool. (Pool Heater included in cost). Pool depth 1.35m. Underwater swim tunnel. Private roof top 6 person independent Jacuzzi. Notes on accommodation: All 3 bedrooms are fully air-conditioned along with lounge which has ceiling fans. There is an internal door fitted from bedroom 1 into bedroom 2. This is peace of mind if you have small children. Bedroom 3 is only accessible from the patio door. Outside: Private Lagoon Heated style pool. The pool has sun loungers. Downstairs patio has dining for 4 people with parasol to escape the midday heat. Upstairs has dining for 6 people and sun loungers. Heated Spa for 6 people. Utility Room: Washing machine and drying rack located on the roof terrace. Cleaning / Towels / Linen / Maid service: The villa is cleaned prior to your arrival and departure, bath towels-bedding etc included. beach towels are not provided. Linen towel changes each week. Pool and Spa cleaning each week. Pool heater included. Other: Contemporary decor throughout. Non-slip tiles surround the pool area. Fabulous villa with everything you need to have a great holiday. Stayed in others on this complex but this villa has it's own personal touches. Great salt water pool that was heated to 27 degree and also a fabulous Jacuzzi. Will definitely be returning in the near future. Fabulous villa that deserves 5 stars. A brilliant villa, great location, quiet everything you could wish for on holiday. have been a number of times before and will be staying again. Had another fantastic holiday at casa woowoo. Great villa, lovely location. Wir haben das erste mal eine Ferienhaus gebucht und können sagen, das wir nicht entäuscht wurden. Das Haus befindet sich in einer sehr gepflegten Anlage. Wir haben auch in der Gegend keine Bessere gesehen. Wir haben den Urlaub sehr genossen. Bei Fragen stand der Besitzer per Mail-Kontakt sehr schnell zur Verfügung. Wir können die Cassa WooWoo einfach nur empfehlen. Thank you for your lovely review. We do very much appreciate your comments and it does help other guests. Thank you for your time and we are very happy you had an enjoyable holiday and you loved Casa Woo Woo Villa. There are plenty of water sports and activities. Surfing, wind surfing, kite surfing and body boarding. You can go walking on Los Lobos, plenty of excursions around the island or maybe visit Lanzarote for a day! You can go on fishing trips or hire a catamaran. The blue flag beaches of Corralejo are only 5 minutes drive from the villa. Hire a car and venture down south to Jandia, where the wind surfing championships are held yearly, and also have spectacular beaches, or go west to El Cotillo which has beaches for surfers, or rock pools for the youngsters and amazing lagoon beaches towards the lighthouse. Hire car recommended to venture around the Island. If not you can go down town and get excursion tours. The airport is 40km around 40 minutes away from the villa, and is around 60 euros for a single trip by local taxi. Corralejo is a 5 minute drive away from the villa. Walking down to Corralejo will take aprox 35 minutes. Taxis are available from reception at very little cost around 5 - 6 euros for a single trip to town. Corralejo is a wonderful town and there are restaurants for every need. Down by the harbour there are a number of fish restaurants, where the local fisherman have gone out to sea, to catch the fish in the morning, to be on your plate by the evening. There are also a number of steak houses, Chinese, Indian and pizzeria's, which are also great. There have been many improvements to the town in the last couple of years. Its a great place for live music enthusiasts or just walking along the front or people watching! For families there is a good selection of things to do which include, Baku water park, ten pin bowling, amusement arcades, mini golf and markets on Tuesday and Fridays. Or simple go around the shops to collect gifts for love ones or a souvenir for yourself. Booking Notes: Deposit is required at the time of booking. The balance will be due 6 weeks prior to your arrival date. Special discounted prices for 2 persons only. Please always ask if discounts applicable for longer than 12 nights..... Prices quoted on this web entry are for 6 persons.............full house! Changeover Day: We ask that guests depart at 10.30 am if there are other guests arriving at the villa that day. However, please ask and check on arrival if you are able to stay later in the villa if catching late departure flight. Notes on prices: Prices quoted are for 6 persons and in sterling or euro at the same rate. Prices are discounted for 2 or more ...........please ask when submitting enquiry for availability.